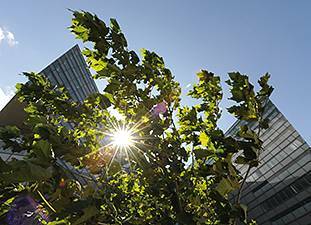 In September 2015, Siemens announced its intention to cut the carbon footprint of its operative business in half by 2020 and to become climate neutral by 2030. To achieve this, Siemens is focusing on four levers: energy efficiency, decentralized energy systems, intelligent e-mobility solutions and the purchasing of clean electricity. Siemens is investing €100 million in improving the energy efficiency of its own buildings and production facilities with expected annual savings of about €20 million from 2020 onwards. Since the program launch, Siemens has managed to reduce its CO2 emission by around 33%. In 2016, Siemens joined the Carbon Pricing Leadership Coalition (CPLC). One year after the launch of its decarbonization program, Siemens is already making significant advances in reducing its carbon footprint. The company was able to cut its CO2 emissions from 2.2 million tons in fiscal 2014 to 1.7 million tons in fiscal 2016. A major portion of the carbon dioxide savings – 200,000 tons – were achieved at locations in Germany. Read more about "The Future of Energy - A Roadmap to Decarbonization"
Read more about "CO2-Neutrality as a Business Model - Why Climate Protection Can Be Profitable"
With steps like an elaborate waste system, a location-wide compression-air system, a central drinking water purification unit and Siemens' largest solar power system on the roof, Kalwa has become a green showcase piece for Siemens. It's hard to think of any other country that has such a long-standing shared history with the company. 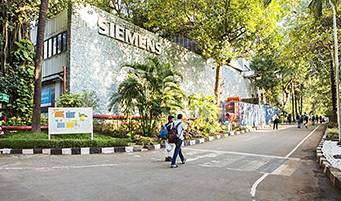 Siemens established itself in India 150 years ago with the construction of the London - Calcutta telegraph line. The company began manufacturing electric motors in Kalwa in 1966. We will invest €100 million in energy efficiency projects at Siemens' sites by 2020. Not only will we be saving resources that are becoming increasingly scarce, these projects are financially beneficial for our company: We expect to generate around €20 million in savings through our investments. Thus far, we have initiated a total of 27 energy efficiency projects at Siemens' sites all over the world, and eight have already been completed. Marriott partnered with Siemens for its ambitious energy efficiency program, initially involving 15 hotels. The goals: Cut water and electricity use in participating hotels by 20 percent and emissions by 10 percent by 2020. The program aims to deliver substantial cost savings with low upfront investments, without impacting guest comfort. Siemens energy experts now remotely monitor consumption data and optimize energy efficiency on an ongoing basis.